In the last decade, a strong experience in the field of surface chemical and biochemical functionalization aroused from the activity of designing, micro-fabrication and testing of miniaturized biotechnological devices including DNA micro arrays, immunosensor systems and proteins chips to be used in early cancer diagnostics. For all these applications specific modification of surfaces is crucial and mandatory. Depending on the final application, proper functional amounts are introduced on surface either to create reactive sites able to covalently anchor biomolecules and to improve the compatibility of materials by preventing nonspecific adsorption which may have an adverse effect on the performance of bio-devices. Silicon and Silica based platforms are modified by means of organosilane chemistry (e.g. silanization by 3-aminopropyltriethoxysilane – 3-APTES) both via anhydrous liquid phase in hydrocarbon solvents (Schlenk line) and via plasma assisted gas-phase reaction. 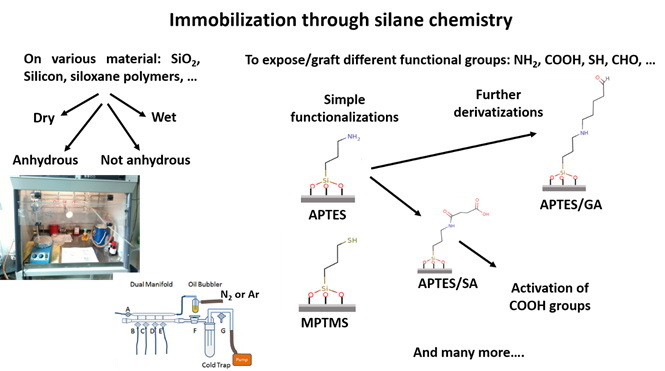 Silanization plasma assisted process has been also applied to high oxygen-content polymeric surfaces (such as Polycarbonate - PC), which surface, chemically inert, can be so modified, introducing monotype functional groups able to covalently bind amino- modified oligonucleotides or antibodies (e.g. Anti angiopoietin). The resulting NH2- terminated surface has to be further modified followed by a further derivatization with succinic anhydride (SA), to generate an ordered flat layer of carboxylic groups. Metallic substrates and nanoparticles (Ag, Au) are modified by alkanethiols (-SH) The possibility to find these molecules with different chains lengths and end groups with specific chemical properties, with a higher versatility with respect to organosilanes makes them particularly suitable to act as cross-linker to anchor the biomolecules to the substrate. As single strand DNA probes can be properly modified by –SH group, for metallic surface the chemical functionalization step can coincide with the bio-functionalization step, i.e. the immobilization of oligonucleotides specifically synthesized to hybridize a specific target (eg. ss-DNA, RNA, microRNA). In such cases, the both, alkanethiols and SH-modified oligonucleotide probes are mixed in order to get a suitable later spacing of bio-receptors thus favoring target recognition. In addition, functional organic coating deposition by means of Plasma Polymerization have been studied and developed in order to modify the surface of very different materials by introducing monotype function groups without the need of a specific chemical binding with the surface (no-dependence on chemistry). In particular, the efforts have been focused on thin polymeric films (10-100nm), characterized by high density of carboxylic functional groups, obtained by plasma polymerization of monomeric compounds such as acrylic acid – AA (CH2=CHCOOH), compatible, due to the optical characteristics, with biophotonics. Plasma co-polymerization processes are under study in order to dilute the chemical functional groups and increase the stability of the thin films. They are carried out by mixing the acid precursor with styrene that does not contain specific functionalities, but simply provides hydrocarbons to reinforce the resulting polymer backbone chains. The precursor reactant have to contain preferably unsaturated bonds (double or triple) which give rise to chain propagation, mandatory for the polymer formation. The molecules coming from reservoir suitable to contain liquid reactants and carried into the process chamber (Base Pressure = 10-2 mbar) by an inert gas (for example Argon) are fragmented by the plasma discharge mainly on the basis of a radicalic mechanism of bonds breaking, and preferentially of “pi” (π) bonds. The discharge is excited by a Radio-Frequency generator (RF=13,56 MHz) in a process chamber whose geometry and electrodes configuration are typical of a low-pressure Plasma Enhanced Chemical Vapour Depostion (PECVD) system. create reactive functional chemical groups (i.e., NH2, CHO, OH, etc.) 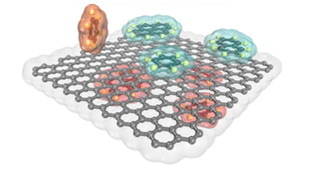 exposed at the surface and able to graft selectively specific molecules. In the last decade, the study and development of biosensing platforms aimed to early and in-trace bio-diagnostics induced the study of biological research protocols and methodologies in order to adapt them to the specific solid substrates, core of the sensing platforms and asses readily-reproducible step-by-step procedures for biospecies handling, grafting and detection suitable for the several biosensing experiments and signal transduction methods. a) the choice of surfactants, buffer composition, pH condition, etc. compatible with the material of the solid support, i.e. the biosensor, for the covalent grafting of the receptor (e.g. Antibody-proteinA/G oriented)/probe (e.g. ss-DNA) grafted on the surface thanks to the previous chemical functionalization. These media at the same time have to solvate the biospecies and to leave unaffected the substrate properties (roughness, chemistry, structural integrity, etc.). c) the sensors regeneration so allowing the re-use of the same chip/device only for the last step target detection without the need to repeat the chemical functionalization and the bioreceptors/probes grafting on a new item.